It’s no secret many of us love eating sushi today. Sushi seems to be as popular as McDonalds. Sushi shops are literally located all over Melbourne. There is one practically every one or two blocks in the CBD selling takeaway sushi. Japanese restaurants are aplenty too, some serving sushi on huge sharing platters. Sushi is believed to have originated in Southeast Asia where people mixed fish with rice in order to preserve the seafood. This spread to Japan around the 8th Century; eating fish with rice was popular with the Japanese. From then on, the Japanese experimented and created different types of sushi and this cuisine eventually spread around the world. What exactly is sushi’s appeal? Why do so many Asians, Westerners and other races like eating sushi all the time? Sushi is one of those convenient takeaway foods. Pieces of sushi can be easily tucked away in paper bags or disposable plastic cases and easily carried around. Plus, sushi is relatively clean finger-food: sticky rice holds the condiments together, sometimes with the help of seaweed wrapped around. Also, bite-sized pieces of such sushi tend to fit snugly in our mouths. Rarely will you find a roll or plate of sushi swathed in oil. Steamed rice is sushi’s main ingredient and so a plate of this delicacy tends to be healthier compared with a plate of fried fish and chips, making the former a go-to choice for the health conscious. However, it is worth noting eating too much of sushi – and anything – can be bad for us. Sushi is often eaten with wasabi and sushi rice is usually seasoned with vinegar, making sushi a highly acidic meal that can upset sensitive stomachs. Studies have also shown seaweed, ever a key ingredient in sushi, contains high levels of iodine that can cause thyroid problems. Bite into sushi and you’re almost guaranteed to experience an explosion of distinctive flavours tickling your palate. Tangy vinegar-tinged rice, sweet mayonnaise, nutty sesame seeds, sweet-and-sour teriyaki sauce are just a few of them bound to hit your tastebuds when you eat sushi – sometimes one at a time, sometimes all at once. Sushi comes in astounding assortments. Inari, nigiri and maki are some of the traditional kinds of sushi around. Then there are the “Westernised sushi” handrolls greeting you from behind refrigerated sushi display cases when you walk into sushi shops in Melbourne – teriyaki chicken, California and spicy tuna rolls to name a few. Gourmet sushi or hybridised, fusion sushi exists on the more expensive end of the dining spectrum. For instance, soft shell crab and dragon roll sushi are often some of the more modern (Westernised) variations of sushi – they’re tricky to find in Melbourne and much pricier and more unusual in taste than your average California roll. Spoilt for sushi choice, oh yes we are. For many of us who aren’t Japanese, sushi wasn’t a cuisine we grew up eating and is essentially foreign food to us. Eating food from different cultural groups never gets boring. It’s always nice to mix up what we typically eat with something adventurous, teasing our palates with something new. Sushi doesn’t come cheap, at least in Australia. A sushi handroll or a nigiri costs around $2.50 here. Eating roughly four rolls or pieces usually makes one feel like they had a decent meal, and this tends to drain the wallet about $10. Then there are the sushi trains that I personally think rip you off with their small portions. Funnily enough, there are barely complaints about sushi prices Down Under – Australians are willing to spend on sushi. We must look classy and exotic dining on sushi. It’s a treat. So many days of the week. Do you like eating sushi and why? What’s your favourite sushi? Do Asians Secretly Prefer Eating Western Over Asian Food? This entry was posted in Asian, Food, Lifestyle and tagged Asian, culture, food, japanese cuisine, japanese food, multiculturalism, opinion, Photography, sushi, takeaway by Mabel Kwong. Bookmark the permalink. I love sushi too, but I can’t afford to eat it very often. Me too, Matt. Sushi is expensive. You pay lots of dollar for a small piece. And there is no guarantee the sushi you buy is fresh. Hope you are well! Come to Japan. There is very cheap Sushi. You can eat sushi by 1 dollar for piece of sushi. Maybe one day I’ll come to Japan. Would love to try the sushi there. I love sushi! I always feel fresh afterwards, not like that greasy feeling that I have after Maccas of KFC. The exotic idea is one worth exploring further. It occupies my thoughts just now because I was walking through Coles and wondering to myself why “ethnic” food is so expensive. For example, you can buy a Turkish loaf in Aldi for about $2 but in Coles it is $4. Meanwhile, a tank loaf that is about half the size is $2. This annoys me because I generally eat food defined as ethnic (Turkish bread.) I suspect Coles is using a pricing policy so that ethnic cuisine is positioned as gourmet and high prices while other food is positioned as bogan, low priced and average. From a business perspective, I think you hit the nail on the head. Rice is relatively cheap if you buy in bulk, and a lot of the time sushi makers/rollers in Australia tend to pack as much rice as possible into a serving of sushi. I’ve heard around that Australian sushi tends to be more “creamier” (more mayo) than sushi in Japan. As for the raw fish not being fresh, there is always the possibility this is so. On a number of occasions, I’ve bought sushi rolls, bit into them and to my horror discover the rice is hard – not overcooked, but probably day-or-two old. But it’s definitely something I will choose over Maccas or KFC, and sushi doesn’t give me reflux easily compared to the other two. True that. Turkish bread, and pita bread, are always much more expensive than a regular loaf of bread at Coles or Woolies. I find normal bread here expensive anyway. I tend to go for the half loaves – $3 is just a bit much in my opinion. I would buy the ethnic bread but no one else at home eats it. I love vegetarian sushi!!! Haha. Sushi is okay for me but nothing extraordinary. I used to eat it every once in a while but since i got two years back food poisoning from it (my only so far) I try to avoid sushi with fish fillings. Besides at least here in Finland it is insanely expensive compared to the amount you get. I am always amazed how many sushi restaurants appeared in the past decade all around Europe. In some cities these restaurant popped up like mushrooms after a late summer rainy day. It seems that sushi is quite pricey everywhere. I got food poisoning from sushi recently on New Year’s Eve. I had one soft shell crab sushi and one crispy salmon skin one and didn’t feel too good for the rest of the afternoon. Luckily I was well enough to see the NYE fireworks that night 🙂 Never had sushi since then…yet. It seems that for every street-side cafe you see these days, there is one sushi restaurant in your face. 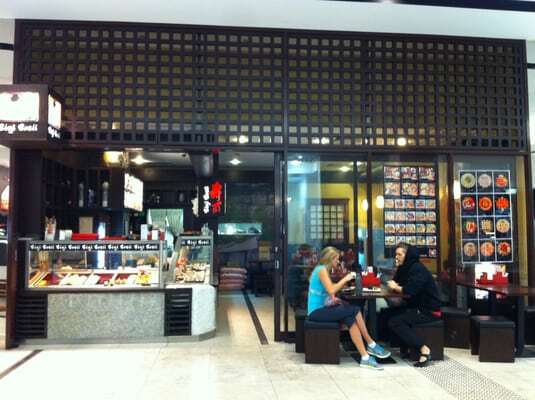 They have definitely become staples in food courts in shopping malls in Australia. So many similarities around the world. Your memory serves you well! A sushi in Melbourne can costs anywhere between $2.50-$3.50. The $3.50 ones are usually more filling. I always ask the sushi vendor to cut up my sushi so I can eat it up with chopsticks – usually gets cut into four pieces according to my demands. Yes! Your homemade sushi looks so nice! I MUST make a trip down to your end of the world to try it! Yes, I completely forgot about that – sushi is a fresh kind of food (if you don’t refrigerate it overnight, that is). I love it when I can taste the freshness of raw salmon in sushi! Not a huge fan of the processed tuna in some sushi hand rolls, though. I do enjoy Sushi, it seems to me healthier and tastier than other forms of fast food…don’t eat it often though. In America, sushi is sort of cheap compared to what you get. I never eat displayed sushi. It has to be made fresh right in front of me. It tastes better that way. Also, I feel like sushi is a trend. People around here go for sushi like they would for coffee. It brings people closer together, giving them a hobby of sorts. You certainly have good taste in sushi, Dalton. Personally I think sushi made fresh right in front of me definitely tastes way better than the display ones – a few weeks ago I bought one of them display ones as I was on a rushed lunch and the rice was hard. “sushi is a trend”. Interesting way to put it. In recent years healthy eating and detox diets have been popular, so maybe that’s why sushi has become a popular choice of food all over the world these days. Fresh sushi always tastes best in my opinion. Sounds like there are a variety of sushi options where you live. That was the first and the only time I have tried Sushi. I hope you enjoyed the complimentary sushi you got, and you liked it and you will get sushi at some point 😊 Sushi here is so expensive here in Australia. Even the food court sushis are expensive!